The last of the great film magazines in Bollwood 'g magazine'. After the cinema-literate Bhawana Somaaya left, it sort of fell apart at the seams. The magazine lost all its sense and sensibility without a proper captain at its helm. Pity. Great covers - and I do mean, really amazing covers - features, in-depth analysis, serious film journalism, fantastic shoots, a heady mix of mirth and matter, loads of fluff and intellectual stuff... it had everything. And then, it came to nothing. I think 'g' has now stopped publication in India. Publishing is a perilous industry. "Seven weeks after its release, Subash Ghai's Khalnayak continues to be embroiled in controversies. 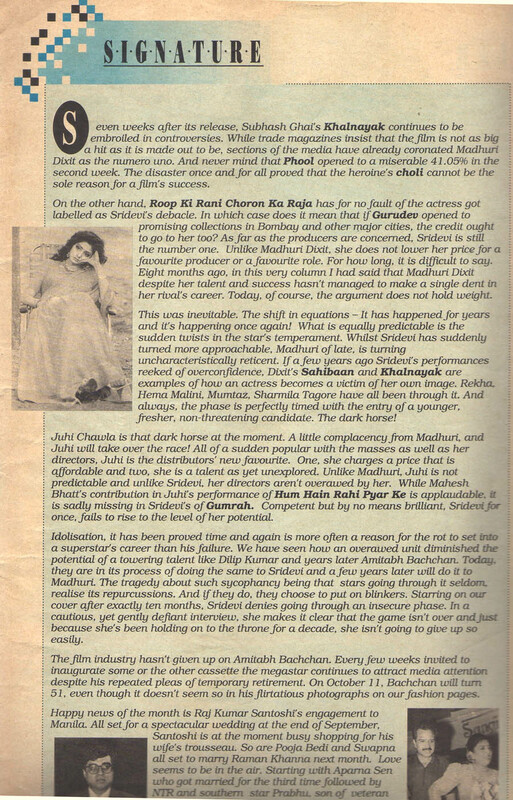 While trade magazines insist that the film is not as big a hit as it is made out to be, sections of the media have already coronated Madhuri Dixit as the numero uno. And never mind that Phool opened to a miserable 41.05% in the second week. This disaster once and for all proved that the heroine's choli cannot be the sole reason for a film's success. On the other hand, Roop Ki Rani Choron Ka Raja has for no fault of the actress got labelled as Sridevi's debacle. In which case does it mean that if Gurudev opened to promising collections in Bombay and other major cities, the credit ought to go to her too? 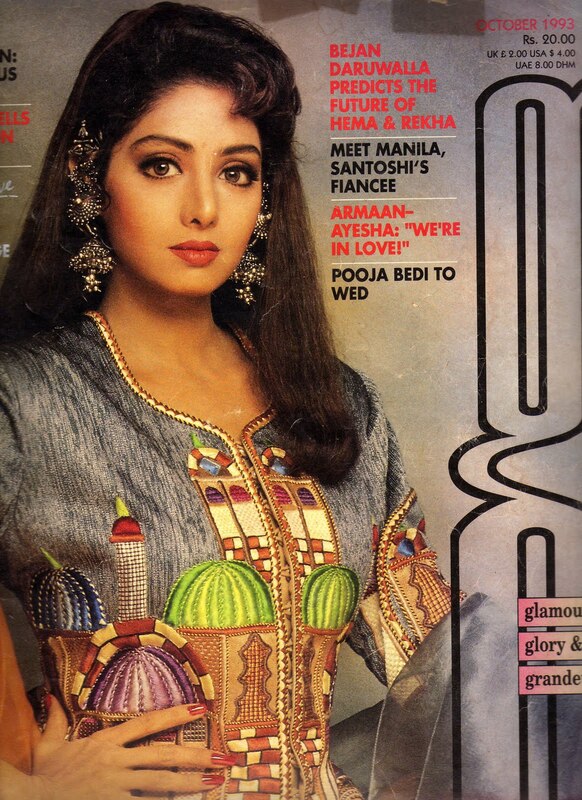 As far as the producers are concerned, Sridevi is still the number one. Unlike Madhuri Dixit, she does not lower her price for a favourite producer or a favorite role. For how long, it is difficult to say. Eight months ago, in this very column I had said that Madhuri Dixit despite her talent and success hasn't managed to make a single dent in her rival's career. Today, of course, the argument does not hold weight. This was inevitable. the shift in equations - it has happened for years and it's happening once again! What is equally predictable is the sudden twists in the star's temperament. Whilst Sridevi has suddenly turned more approachable, Madhuri of late, is turning uncharacteristically reticent. 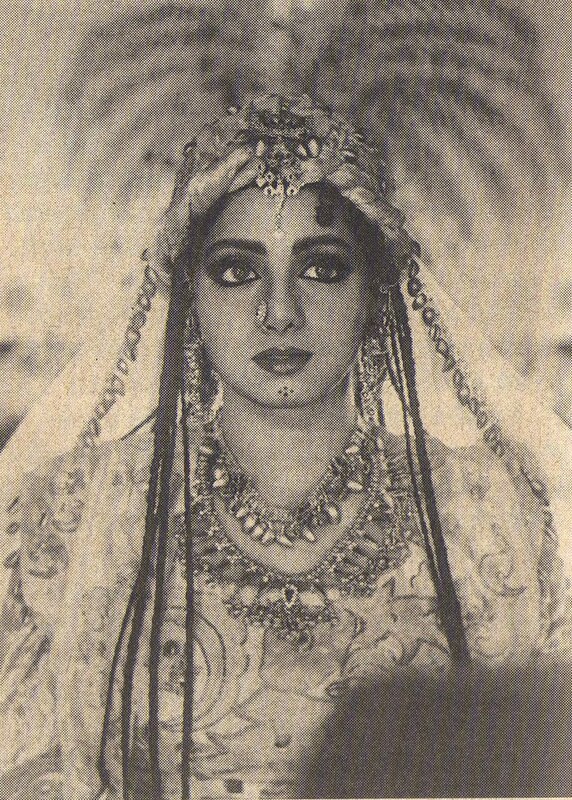 If a few years ago Sridevi's performances reeked of overconfidence, Dixit's Sahibaan and Khalnayak are examples of how an actress becomes a victim of her own image. Rekha, Hema Malini, Mumtaz, Sharmila Tagore have all been through it. And always, the phase is perfectly timed with the entry of a younger, fresher, non-threatening candidate. The dark horse! Juhi Chawla is that dark horse at the moment. A little complacency from Madhuri, and Juhi will take over the race! All of a sudden popular with the masses as well as her directors, Juhi is the distributors' new favourite. 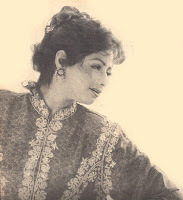 One, she charges a price that is affordable and two, she is a talent as yet unexplored. 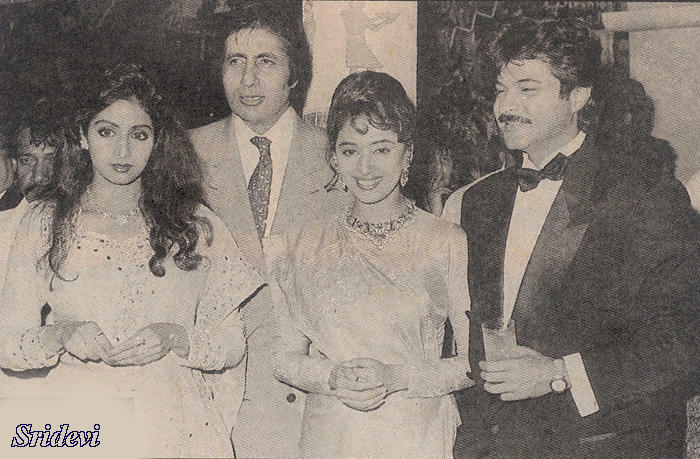 Unlike Madhuri, Juhi is not predictable and unlike Sridevi, her directors aren't overawed by her. While Mahesh Bhatt's contribution in Juhi's performance of Hum Hain Rahi Pyar Ke is applaud-able, it is sadly missing in Sridevi's of Gumraah. Competent but by no means brilliant, Sridevi for once, fails to rise to the level of her potential. Idolisation, it has been proved time and gain is more often a reason for the rot to set into a superstar's career than his failure. We have seen how an overawed unit diminished the potential of a towering talent like Dilip Kumar and years later Amitabh Bachchan. 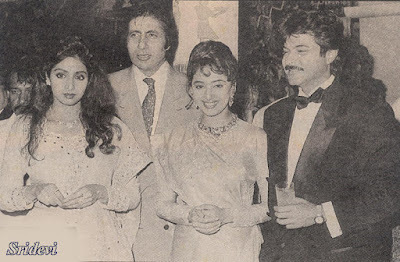 Today, they are in it process of doing the same to Sridevi and few years later will do it to Madhuri. The tragedy about such sycophancy being that stars going through it seldom realise its repercussions. And if they do, they choose to put on blinkers. Starring on our cover after exactly ten months, Sridevi denies going through an insecure phase. In a cautious, yet gently defiant interview, she makes it clear that the game isn't over and just because she's been holding on to the throne for a decade, she isn't going to give up so easily..."
She is leaving for Madras the next morning and her evening is packed with appointments. you tell her you are pressed for time and need to do the interview at the earliest. She reflects for a while. "Is 8 o'clock too late for you?" she asks gently. Every time her kitchen door opens and closes shut, a familiar aroma of home cooked sambar fill your nostrils and every time Sridevi walks in and out of her bedroom, melodious notes from Mani Ratnam's latest Tamil film fill the atmosphere. Sridevi is at home and you can tell that from the way she walks barefoot, her curly hair pushed back with an Alice band, face devoid of make-up. In the interview that follows, she discusses her past - Roop Ki Rani Choron Ka Raja - her future Gumrah and most important - herself. 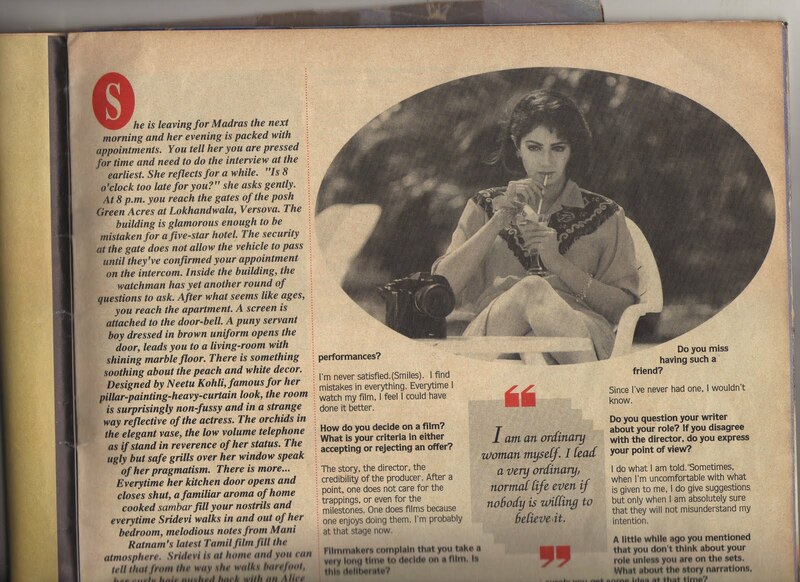 In probably her first candid interview relating to work, she articulates her observations on how the actress in her prepares for a role... Sipping strawberry mikshake, she waits for your first question. You must be disappointed that RKRCKR didn't do well. 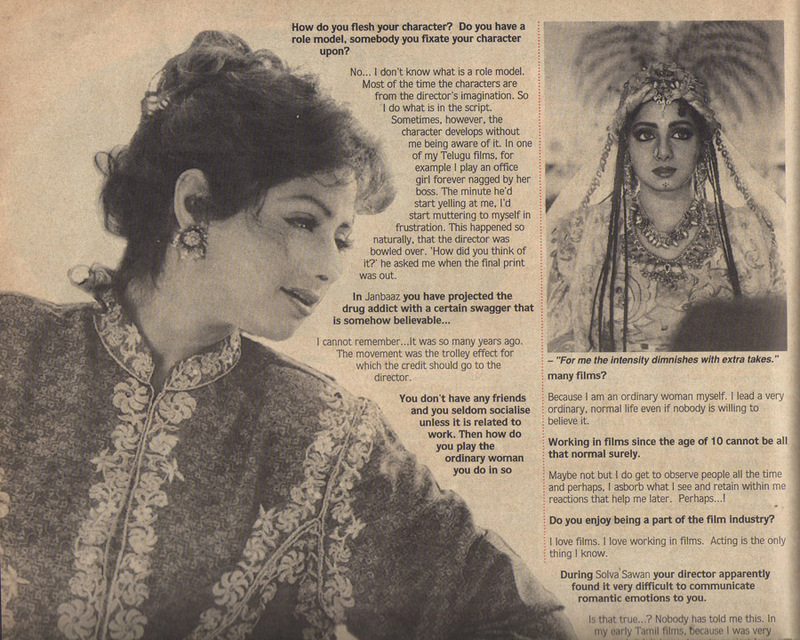 Sridevi: Definitely. It is only natural, isn't it? We all tried our level best, but five years is a long time. Trends change, moods and fashions change. Maybe we lost out to time. How affected are you when a film of yours flops? How do you cope with such setbacks? See, I'm miserable only when I'm told that I'm not good in the film. The box-office faring is not in my control. So I don't get depressed. Instead, I want to immediately find out what could have gone wrong and if possible, rectify my mistake in the next film. How critical is your family about your work? Very critical. They seldom like my work. When they do, they tell me so. You'd be surprised, but they are very accurate in their judgement of my films. rarely has a film they have not liked, done good business. What about you? Are you satisfied with your performances? I'm never satisfied (smiles). I find mistakes in everything. Every time I watch my film, I feel I could have a done it better. How do you decide on a film? What is your criteria in either accepting or rejecting an offer? The story, the director, the credibility of the producer. After a point, one does not care for the trappings, or even for the milestones. One does films because one enjoys doing them. I'm probably at that stage now. Filmmakers complain that you take a very long time to decide on a film. Is this deliberate? Today, Yash Chopra, Mahesh Bhatt, Saawan Kumar Tak understand that if I take a long time to decide, it isn't out of arrogance or pride. It's because I'm shy with new people. I don't want to say 'yes' in a hurry and regret it later. The delay is more out of my own confusion than out of distrust of them. But once I say 'yes', my filmmakers know that there will be no problems on the sets. How does the actress in you prepare for a role? Prepare..? (She blinks). There is no definite process of preparation as such. Before the schedule, I go through the routine costume trials with my dress designer. On the sets, the director briefs me on the scene. Here, as you are aware, most of the time we come to know of the scene only when we begin shooting it. Would you say you are a spontaneous actress? I frankly haven't thought on such lines. But I guess I'm better with my first takes. There are a lot of actors who improve with extra takes, but for me, I feel the intensity diminishes. There was a scene in Roop Ki Rani... which I did with great feeling but nobody else seemed to think so. In contrast, the flag scene in Khuda Gawah where I weep thinking of the hero was shot amidst a lot of tension. I felt I was very awkward in the scene and didn't do it as well as I wanted to, but in the final cut, the scene is very effective. Do you have any friends with whom you discuss your work? Do you miss having such a friend? Since I've never had one, I wouldn't know. Do you question your writer about your role? If you disagree with the director, do you express your point of view? I do what I am told. Sometimes, when I'm uncomfortable with what is given to me, I do give suggestions but only when I am absolutely sure that they will not misunderstand my intention. A little while ago, you mentioned that you didn't think about your role unless you are on the sets. What about the story narrations, surely you get some idea at that time? Well, one does get a rough idea about the film during narration but not necessarily. There are some directors who are great story-tellers., while others are great directors. 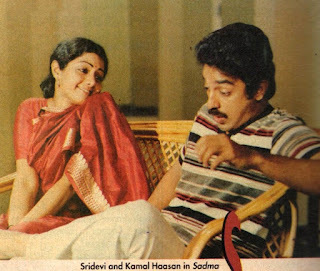 Balu Mahendra's narration of Moondram Pirai (the Tamil original of Sadma), for instant, was a frame to frame narration of the film. Would you believe he took three hours to tell the story? If you had to re-shoot Sadma today, what are the changes you would like to incorporate in your performance? First and foremost, I'm not sure if I would be able to do the Sadma role again. Already, I've done it twice. I think doing Sadma would be far more difficult now than it was a few years ago. Now I am older, and not as innocent. How do you flesh your character? Do you have a role model, somebody you fixate your character upon? No... I don't know what is a role model. Most of the time the characters are from the director's imagination. So I do what is in the script. Sometimes, however, the character, develops without me being aware of it. In one of my Telugu films, for example, i play an office girl forever nagged by her boss. The minute he'd start yelling at me, I'd start muttering to myself in frustration. This happened so naturally, that the director was bowled over. 'How did you think of it?' he asked me when the final print was out. I cannot remember... it was so many years ago. The movement was the trolley effect for which the credit should go to the director. You don't have any friends and you seldom socialise unless it is related to work. Then how do you play the ordinary woman you do in so many films? Because I am an ordinary woman myself. I lead a very ordinary, normal life even if nobody is willing to believe it. Working in films since the age of 10 cannot be that normal surely. Maybe not but I do get to observe people all the time. and perhaps, I absorb what I see and retain within me reactions that help me later. Perhaps...! Do you enjoy being a part of the film industry? I love films. I love working in films. Acting is the only thing I know. During Solva Sawan, your director apparently found it very difficult to communicate romantic emotions to you. Is that true? Nobody has told me this. 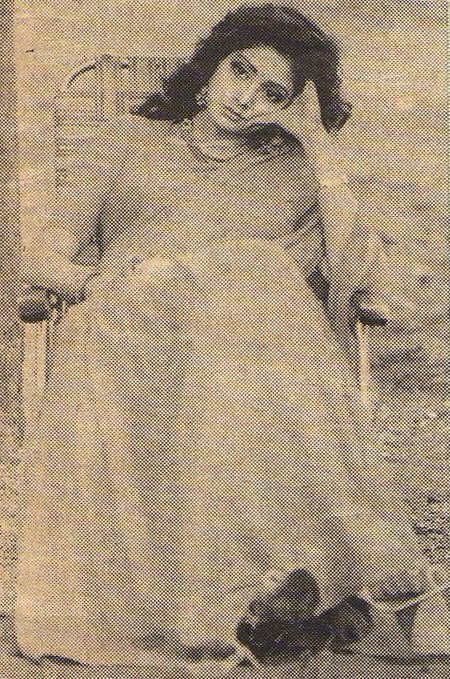 In my early Tamil films, because I was very young, I didn't know how to project love scenes. One director told me to look sad. For a very long time after that, every time I had to do a romantic scene, I borrowed the expression. Only much later, when I was old enough to gather from my own experiences, I did the scenes differently. I mean you become childlike. It happens even in a serious film like Gumrah - during the prison scenes specially. Ah... I feel the character in Gumrah is very mature. In the prison scenes, the character is supposed to be very vulnerable. you feel she is childlike because she is unsure. You are often defensive in your intimate scenes. You hold back too much. In Khuda Gawah for instance, you don't embrace your hero as someone who has separated from her lover of 20 years would. In Chandni too, the love scenes lack the passion Yash Chopra's Silsila had for instance. I am surprised. Nobody has pointed this out before. I don't know what to say. Maybe I should see these films again. Co-stars who've worked with you say you are very particular about your appearance while shooting. (Laughs). On the contrary, I feel I don't give adequate attention to my looks. I truly believe how I look is the cinematographer's problem. it is his job to make me look presentable. Costumes, accessories, do matter. Very often when watching a film, I feel I should have worn a dull saree to emphasize the unhappy scene, or have combed my hair neatly when they were shooting a close-up. But these imperfections continue. Maybe that's what shooting is all about. After Khalnayak it is being said that Madhuri dixit has displaced you. Smiles. Every few years, the media pulls out new names and compares me to them. It's been going on since '82, since the time I came. In a way they are complimenting me for obviously they have not been able to come up with new names to sustain these controversies. The constant comparisons with Madhuri Dixit, do they irritate you? Earlier there were different names. Now they are different ones. I think its a part of the game and I take it all in my stride. You've made a statement that you would never do the dhak dhak dance that she has done in Beta. I said that she danced extremely well and I'm not sure if I would have been able to do justice to the number were I in her place. Apparently she was upset by your comment. I said it exactly in the way I have just told you. How it appeared in print and why she got angry, I don't know. Surprised. No. I'm not. I have not seen the film. For a long time now you have not given a dance that would whip up mass hysteria the way Choli ke peeche has. There is a time and place and film for everything. Kaate nahin kat te was the first of its kind. There have been so many versions after that but none have been as effective. You can call it the magic of the first but even if I want to, I will not be able to repeat a Hawa Hawai or Raste mein woh khada tha (of Chaalbaaz). What do you think clicked about these dances? The picturisation, the situation of the song, the music, everything was just perfect. Of the future projects which of the dances do you look forward to? Chandamukhi has good dances. So does Gumrah. The are not as energetic or as motivated as RKRCKR but I've enjoyed doing them. They are causal and sort of blend with the character I play in these films. Are you happy with the way Gumrah has shaped up? What are you expecting from the film? I am more than happy with Gumrah. I expect from this film what I expect from all my films. Everything! (Laughs heartily). What was the experience like working with Mahesh [Bhatt, director of Gumrah]? Wonderful. I've enjoyed working with him tremendously. I was so scared of doing this film. People had told me all sorts of stories about the man, his life-style, but he is quite simple and uncomplicated. The way he inspires his artists before a scene, the way he explains a situation, it's a pleasure. He does not bind you with instructions. Instead, he helps you draw from your own experience and then leaves you to bring it out in a manner you are comfortable with. The technique is quite extraordinary and something every true artiste appreciates thoroughly. In short, you are impressed with him as a director. Most certainly. I'm not sure if any other director in his place would have chosen a subject like Gumrah. Mind you, I'm not saying that he has made a classic or even a Mother India, but in terms of detailing and spontaneity, this film is undoubtedly special. The scene when the prison door is jolted open to take away Soni Razdan, when she is to be hanged gives me goose-flesh. I think Soni walked extremely well, in this scene. Which is your favourite scene in the film? Takes a long pause. It's difficult to say, but I like my scene with the mother just before she is going to die and also my expression when they take Soni out of the prison. The whole sequence is something one has not seen on the Indian screen. The blunt cut wig you wear in the film makes you resemble Divya Bharti. Shrugs. I didn't think about it. Filmmakers feel that your being over selective can have dangerous implications on your career. They are probably right. When I'm doing 10 films and five flop, I still have five hits to my credit. But now with just a handful of assignments, I am in trouble!. But I don't mind. I'm happier this way. The pace of work had become too much and I needed breathing space. Besides, it isn't as if the offers have stopped coming. So the choice is my own. Opinions cannot rule my life all the time. Don't forget these are the same people who when I signed too many films said I did it out of insecurity! Today, when you don't, do you feel insecure? Startled. No. Not as yet. I still get my rpice. And I still work on my own terms. And it isn't just filmmakers in Bombay who are complaining. Filmmakers down South too feel the same way. They feel I take too long to brood over subjects and too long to say 'yes'. But that's what I want to do. Is it all that easy - finding Mr. Right, I mean. Sigh.. See, I don't expect too much from life. As long as he is understanding, caring and loves me, I can adjust to anything. I am not a dreamer and I'm not too demanding either. Whatever I get, I am happy. I feel life has been kind to me. What about memories that are not pleasant?